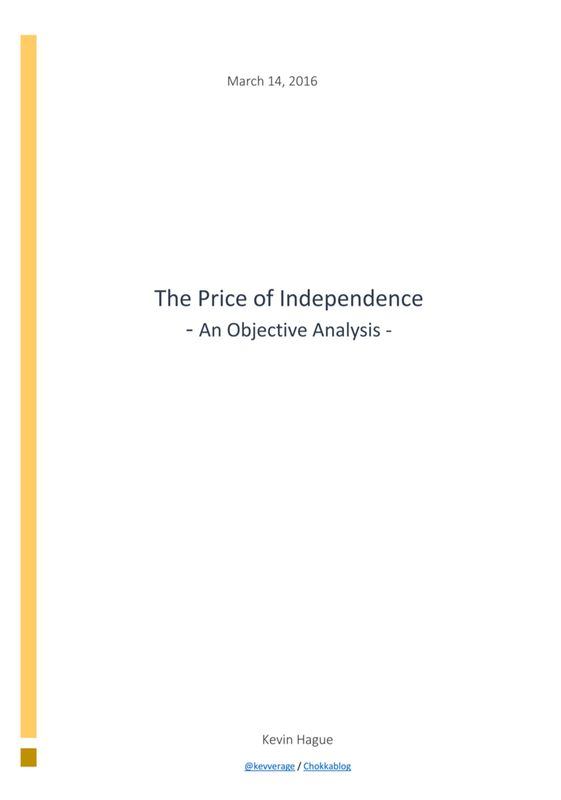 I don't have the time or energy to go off on a massive side-bar analysis of UK versus Ireland and the impact of the financial collapse, bailout and austerity measures on the people of Ireland. 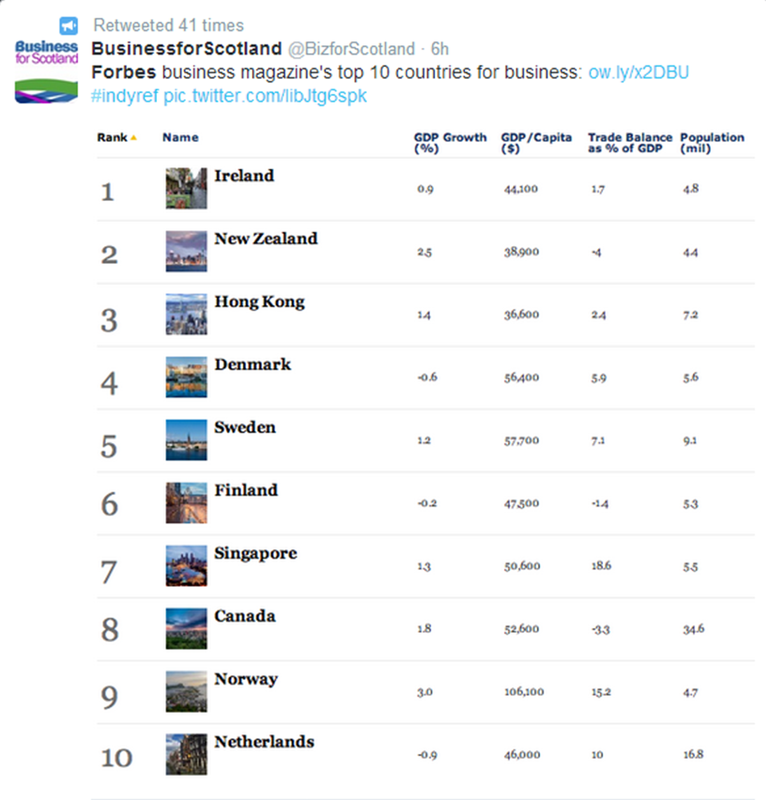 There's a good reason why the SNP don't point to Ireland (or Iceland) anymore as their exemplars of what an Independent Scotland could look like. Most people get that it has been pretty nasty, so it's a pretty niche argument I'm responding to here. I'm not arguing that GNP is the best measure ... but it's arguably a better measure of how the nationals of a country are faring. Ireland ranks behind the UK on this measure but I don't draw any conclusions from that; it simply illustrates that it is easy to find measures with rankings to support different cases if that is the game you choose to play (I don't). 2. 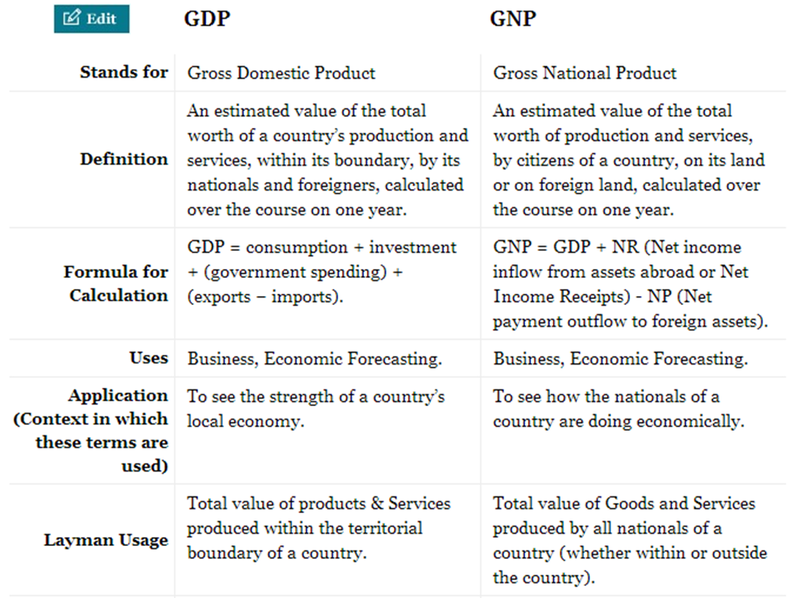 For those who say "whats wrong with just comparing GDP/Capita"
I've chosen those two areas to illustrate my point, not to draw conclusions. My point is precisely that it is lazy and weak-willed to leap to snap conclusions from a handful of simplistic measures; I'm sorry, but it's just more complicated than that. If you look at the actual original Forbes table "best countries for business" it clearly explains that it's "based on country’s major stock index returns for 12 months through November 20 ". Do I really need to spell this one out? The Irish stock market has still lost about 50% of its value since 2008 even following the growth in 2013; hardly a great case for mimicking that particular Celtic Tiger is it? Your attack on Business on Scotland here is entirely unjustified. You are taking a Tweet and placing it into the context of your own discussion. It is simply a Tweet on a Forbes List with the original source cited. The Tweet makes no assertions about the data. If that is the criteria for 'risible' I could equally label your blog the same. Secondly, I took your (slightly patronizing) advice and looked closer at the http://www.oecdbetterlifeindex.org site. I found that Ireland ranks higher than the UK - averaged over all 11 indices, you only mentioned the indices where it ranked lower. It is the facts you miss out which makes me suspect your objectivity and balance. However I agree with you wholeheartedly about GDP. Here is an excellent TED talk on the subject of the "Social Progress Index" explaining why GDP is pretty awful generally. The one index that really matters to me on that OECD list is 'Life Satisfaction' and again its the usual suspects which rank the highest Denmark, Iceland, New Zealand, Canada, Sweden. Whilst I believe your stats to be accurate and your motives to be pure Kevin, it will take a huge number of these blogs before you can convince me that an independent Scotland would not be capable of joining these mature western democracies on that list.